Easy-to-follow recipe and video for Pink Grapefruit Stuffed Soy Marinated Chicken. This authentic Japanese recipe is full of flavor and spice and makes a colorful addition to any party table. Soy marinated chicken is one of the most traditional ways to cook chicken in Japanese food culture. Our recipe arranges a bit of this traditional dish with a touch of pink grapefruit and sansho powder for a sensational combo that packs lots of flavor into a small package. The result is a healthy Japanese recipe that is also delicious. While the presentation on this dish is important, it is nowhere near as hard to make as it might look. Use our easy-to-follow recipe to make this delicious dish at home and impress your friends and family. Kuwa-Yaki literally translates as “Hoe-Grilled”. It’s named after a farming tool people in Japan have used in the fields since ancient times. It’s said that while taking a break, farmers cooked marinated chicken on a hoe, hence the name. Said to be the original form of teriyaki dish, Kuwayaki is an authentic Japanese recipe that we have used as a base for the Pink Grapefruit and Soy Marinated Chicken recipe here. You don’t have to use an actual hoe or any other garden tool to make the dish, of course! The art is in the marinade and the act of pan frying that renders a nice golden skin to the chicken. Widely used in Japanese food culture to season both sushi and a variety of noodle dishes, sansho powder is made from the ground berry of the prickly ash tree. It is one of the seven spices used to make the common Japanese spice blend called Shichimi Togarashi. Another common way Japanese people use this powder is to pour it over “Una-Jyu” (grilled eel bowl). In fact, sansho powder is so spicy people often use it in authentic Japanese recipes as a substitute for Sichuan red pepper. That’s how strong it is! If you are making these dish for people that can’t take a little heat you can always lower the dosage of sansho and serve it apart from the meal later. Use a unique container: By just putting everything inside of the skin of the grapefruit, this dish magically becomes an interesting dish. 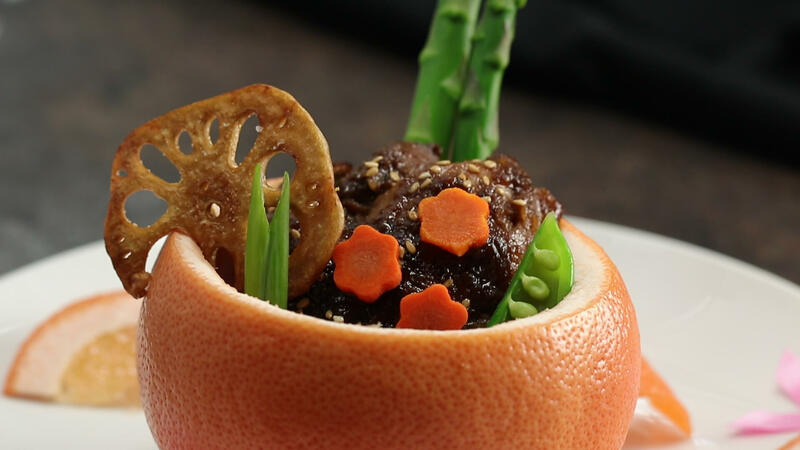 Pack the grapefruit large to small: Using proper depth perception is important in Japanese plating and presentation. Place bigger/longer foods in the back and smaller/shorter foods in the front to balance the look. Use at least three colors: Always follow the rule of three when plating and presenting Japanese food. If for some reason you change an ingredient in this recipe, make sure to replace it with an appropriate color. Make some fine cuts on the surface of the skin side of chicken and season with plenty of sea salt. Put all ingredients of the marinade in a bowl and combine well. Marinate the chicken for 1 hour. Remove the pink grapefruit flesh using a knife. Use several wedges to make 3 tablespoons of pink grapefruit juice. Remove the chicken from the marinade and apply the plain flour. Keep marinade for later use. Remove any excess flour by patting. Heat a frying pan with oil on high heat and place the chicken skin side down. Keep heating until the skin side turns into a nice golden color. Flip over the chicken on the frying pan and keep grilling on a low heat with a lid until thoroughly cooked. Tilt the frying pan and remove/wipe off the excess liquid. Pour the remaining marinade to the frying pan, and simmer the chicken until the sauce is thick and glazed. Remove from the heat, sprinkle some sesame seeds and slice into biteable sizes. Put the chicken in a pink grapefruit cup and assemble other garnishes.